Pack your toothbrushes, but leave your pajamas and pillows behind for this one-of-a-kind bedtime story from Ida, Always author Caron Levis and bestselling illustrator LeUyen Pham. And whatever you do…DON’T YAWN! Gabby Wild has had enough of bedtime. Yawn, curl, snuggle, snore—what a bore! So instead of tucking in, she jets out—with poor Granny in tow—to a place where beds are for bouncing, hushes are shushed, and it’s never too late for ice cream. But sometimes, even when you grit your teeth and seal your lips, it’s impossible to stop that…YAWN! There’s a yawn on the loose! Can Gabby stop that yawn from spreading the snooze, or will it be lights out for Never Sleeping City? "Gabby Wild...has had it with sleep. She convinces her grandmother to take her to Never Sleeping City, where neon lights blink, the streets hop with revelers, and everyone stays up all night long. But somehow, on the Ferris wheel, Granny yawns—and yawns, of course, are contagious... Text by Levis (Ida, Always) crackles, and show-stopping artwork by Pham (Grace for President) is great fun. In affectionate homage to In the Night Kitchen (and maybe to Little Nemo before it), Gabby pilots her own plane into panels of dreamlike urban landscapes filled with carnival characters and vaudevillian antics; other picture book Easter eggs await." "Like many children, Gabby Wild has absolutely had enough of the tedious rituals of bedtime. Gabby asks her grandmother to take her to Never Sleeping City... as they ride on a coffee-mug Ferris wheel, it begins to happen…Granny starts to yawn. Gabby soon learns that once a yawn starts, there's little to prevent it, and before they know it, Granny's yawn is swirling all over the city, affecting all who come in its path... In an interactive twist, Gabby asks readers not to fall asleep—after all, "This is NOT a bedtime story!" But it's far too late; the yawn has proven itself effective not only on readers, but on the protagonist as well. Though the story is set at night, the Sendak-ian artwork remains bright with pops of color that give a buoyancy to the city and its memorable inhabitants... The lively portrayal more than makes up for the most extended yawn depicted in a picture book." "Gabby Wild is in a tooth-gnashing frenzy. She’s got to prevent the people in Sleepytown from going to bed, because snuggling and snoring is such a bore. With Granny in tow, she jets off to keep downtown from settling down and uptown up. Despite her determined plans, Granny opens wide and her yawn is on the loose! Gabby enlists the animals’ Midnight Marching Band to toot and blare; she sings, shouts, stomps, and fusses, but still the city gets cozy and quiet and peaceful. In a hilarious close-up, she looks directly at the reader, saying: “YOU are NOT sleepy, right? Grit your teeth, seal your lips! 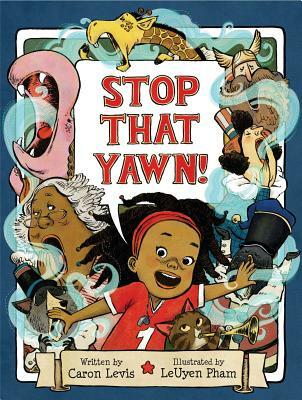 Whatever you do, don’t you dare—YAWN!” At book’s end, while Granny snuggles her cozily, Gabby parties all night in the land of her wildest dreams... Gabby is an appealing African American with a red dress and headband and a riotous mop of hair that fits her energetic personality." "Gabby Wild is sick of Sleepytown. So, when it’s time for bed, she begs her granny to take her some place awake! Instead of settling down, the two jet out to Never Sleeping City, a bustling metropolis with a band, an opera, and even a carnival. Gabby and Granny have a blast exploring the sights—until Granny lets loose a yawn... Levis has created a thoroughly engaging bedtime read that will have little ones fighting back yawns of their own, and Pham’s illustrations are an excellent accompaniment... With a combination of eye-catching illustrations and entertaining text, this engaging picture book is a fantastic read-aloud that encourages plenty of participation. VERDICT: Snap it up for pajama storytime or for bedtime reads displays or shelves." "Everyone knows that yawning is contagious—fine at bedtime, but not in the fantastical world of Never Sleeping City, the nighttime destination of energetic young Gabby Wild and her good-natured grandmother... But once Granny accidentally lets slip a yawn, it’s up to Gabby to try to rouse all the suddenly-sleepy revelers around them... Levis and Pham provide a...high-energy, adventure-minded, brown-skinned, female protagonist embarking on her surreal nighttime adventure."